- Headed into Monday, analysts and the financial news media billed this as "the most important week of the year". - It was and it wasn't. - Here is everything you need to know about the Fed and the ECB. Will this be the "most important week of the year"? Spoiler alert: almost certainly not. And that’s not to downplay the long list of important scheduled events. Rather, it’s just to say that invariably, scheduled events never end up being the ones that matter unless those scheduled events are elections. Again, the point there wasn't to suggest that the Trump-Kim summit, CPI, the Fed meeting, the ECB meeting and the official confirmation of Trump's about-face on the trade dispute with China (remember, it was less than a month ago when Steve Mnuchin seemingly suggested the administration would not in fact be going through with slapping tariffs on $50 billion worth of Chinese goods in June) weren't critical events in terms of their medium- to long-term implications. The point was simply to say that barring some kind of truly unforeseen development in Singapore and assuming Jerome Powell and Mario Draghi didn't go completely rogue, and finally, assuming the tariff announcement was generally in line with what was laid out by the USTR in April, the odds of developed market turmoil this week were fairly low. I'm going to save the EM discussion for a separate post, but suffice to say this week didn't do anything at all to dispel the notion that Fed tightening is going to present a real problem for emerging markets. That's a nice segue into a discussion of the Fed decision. And this will be a relatively short discussion because they were hawkish - full stop. They hiked, the dots shifted, they upgraded their unemployment outlook and they removed the dovish forward guidance on rates from the statement. At the press conference, Jerome Powell underscored his optimistic outlook on the economy and he also announced that starting in January, he’ll be delivering his “plain English” assessments at every meeting, an effort he says doesn’t necessarily signal anything about policy, but which plainly means every meeting will be effectively “live”. Speaking of Powell's "plain English" characterization of his own style, I didn't like it. For one thing, it was (in my opinion), a rather tasteless effort to parlay what he pretty clearly perceives as a disdain for the academic style of his predecessors into favorable reviews of his own performance. But beyond that, the problem here is that he's a non-economist trying to do an economist's job. That won't work or if it does work over the longer-haul, there will invariably be mistakes made along the way. Importantly (and I can't emphasize this enough), it's not that I think the global experiment in NIRP, ZIRP and $15 trillion in QE isn't dangerous. In the same vein, it's not that I think economics is a "hard" science that can be reliably employed by trained practitioners in the service of manipulating and controlling the cycle. Rather, I'm simply stating what to me seems glaringly obvious: when you embark on what amounts to a massive experiment in economics that's resulted in the gross distortion of capital markets on the way to accumulating trillions upon trillions in assets on central bank balance sheets, it's not a good idea to task a non-economist with unwinding that experiment. If you think the experiment was misguided, that's certainly fine (and regular readers know I've written voluminously about how misguided that experiment indeed is), but it's probably best if you let the pseudo-scientists (to employ a Taleb-ism that I am not fond of, but which works here) unwind it and then replace them with "plain English" folks like Powell if that's the route you want to go. What you don't want to do is just bring in someone who isn't as steeped in the intellectual underpinnings of the experiment (however misguided you think those underpinnings are) and task him with effectively dynamiting it. I'll ask you explicitly what is implicit in the analysis above: Who do you want managing an exit from the policies that created those tight relationships? The people who designed the policies or a lawyer? If you said "lawyer" then let me flip the situation around for you. If your lawyer just spent the last decade constructing a system of complex legal loopholes that have allowed you to prosper after suffering from some kind of legal setback, would you be comfortable bringing in a PhD economist to replace him/her even if that economist was well liked in legal circles and had some claim on legal expertise (with that last caveat included to account for the fact that Powell does indeed have a claim on understanding markets)? Probably not, for obvious reasons. None of that is to say that Powell is completely clueless or that he isn't respected by his colleagues. His CV is a lot better than mine (and likely yours) and on top of that, there's a strong argument to be made that his approach isn't all that different from Janet Yellen's (just ask David Stockman). But the fact of the matter is that Jerome Powell is not Janet Yellen (as far as I know) and eventually, that is going to be a bad thing for risk assets. Or at least that's my view. For those interested, you can read a summary of Wall Street's opinions on the Fed meeting here and then if you like Pulp Fiction and Archer references, well there's a highly amusing take on the whole "plain English" episode here. As usual, I include those links because they flesh out all of the points made above in more detail than it's expeditious to employ on this platform. That is, they're provided for those who are interested in some further study on this. Ok, so that's the Fed. The next morning, we got the ECB and if Jerome Powell was interested in learning a thing or two (or twenty) about how to manage expectations and engineer market outcomes while simultaneously orchestrating an exit from an absurdly complex experiment in monetary policy, well then he got a veritable clinic from Mario Draghi who delivered what some folks have described as "a tour de force" and a "classic". Before I delve into this, just take a second to appreciate what it is Draghi is trying to do here. He is presiding over a negative rates regime and a multi-trillion euro asset purchase program that's deployed over sovereign debt and corporate credit issued by governments and companies across disparate economies. Because the EMU comprises disparate economies, the monetary policy transmission mechanism is hopelessly inefficient. I mean, just think about the countries under his purview as a spectrum. On one end is Germany, a bastion of fiscal rectitude and a global powerhouse. On the other end are a handful of countries that are for all intents and purposes insolvent (and give me some rope on that characterization). In addition to the myriad technical issues that go along with adopting negative rates, the asset purchase program is subject to a number of self-imposed rules including issuer cap constraints that effectively limit flexibility. And then there's the "fallen angel" problem which manifested itself in the Steinhoff debacle. All of that is complicated immeasurably by periodic political turmoil that turns sovereign spreads into a nightmarish game of Whac-A-Mole. That is so mind-bogglingly complicated that one wonders why anyone would willingly stay in Draghi's job. As laughably complex as all of that already was, the complexity was compounded in Q1 by a deceleration in eurozone economic activity, Steve Mnuchin's weak dollar rhetoric and Trump's trade threats, which, when taken together, raise the specter of "quantitative failure" by undermining growth, undercutting the inflation target, and undermining growth some more, respectively. And then, less than a month before the June ECB meeting (long seen as the likely/logical time for Draghi to announce the official sell-by date on QE) the Italian political situation, in flux since the inconclusive March election, finally came to a boil, culminating in a 15-standard deviation move in the Italian front end, a bear market in Italian financials and a five-week losing streak for Italian stocks (finally snapped this week). For those of you who watched Jerome Powell's press conference on Wednesday, just try to imagine how that would have gone had he been presented with everything Draghi is trying to manage. And then don't forget to laugh as you ponder how one might go about communicating the strategy in "plain English." So what did Draghi do? Well, I'll tell you. Think of the ECB statement and the subsequent press conference as akin to what would happen if a man with 14 arms equipped himself with 14 rubber mallets and went to the carnival to play Whac-A-Mole. In the statement, the ECB announced that QE in Europe will end in December. In short, that checks the "we're making progress on normalization" box. When it comes to the taper (monthly purchases will fall to €15 billion from September from €30 billion currently) most of what I’ve read over the past several months indicated that a slightly “dovish” outcome would have amounted to a taper to €10 billion/month through December. So €15 billion/month is comforting. The Governing Council expects the key ECB interest rates to remain at their present levels at least through the summer of 2019 and in any case for as long as necessary to ensure that the evolution of inflation remains aligned with the current expectations of a sustained adjustment path. We were expecting an ECB tapering announcement today but not a commitment to keep rates unchanged until at least “the summer of 2019”. While the market has not been pricing a rate hike until later next year, we view the introduction of calendar-based guidance as a material negative development for the euro. First, this is the first time in the history of ECB where such unconditional calendar-based guidance has been introduced. Given that the ECB has refused to “pre-commit” in the past and always ascribed to state-contingent guidance, the willingness to enter into fixed date-based guidance is a material evolution to the policy framework signaling a greater dovishness of the council. Second, even if the market has not been priced for a rate hike until after the summer of 2019, calendar-based guidance shifts the distribution of risks. While the ECB can always extend the calendar guidance further out in the event of negative news, the ability for the market to reprice more hawkishly in the event of better news is now severely constrained. This is further reinforced by the conditional based nature of the end to the PSPP program that has been announced. The real dovish surprise came from the short rate forward guidance: “The GC expects the key ECB interest rates to remain at their present levels at least through the summer of 2019”. The market had interpreted the previous guidance “well past the end of net asset purchases” as six months after, while the new forward guidance indicates this is likely to be nine months. The GC made this even more dovish by moving the statement “in any case for as long as necessary to ensure that the evolution of inflation remains aligned with the current expectations of a sustained adjustment path” from QE to short rates. This essentially makes the gap between end of QE and first rate hike nine months at a minimum. Forward guidance on interest rates: The ECB swapped the vague assurance that rates would remain on hold “well past” the end of QE for a more precise commitment of “at least through the summer of 2019” and as long as it is necessary for inflation to converge towards its aim. So the forward guidance is dependent on a state and a date – or shall we say a season? Mr Draghi would not elaborate on whether “through the summer” left open the possibility of a rate hike at the meeting scheduled for 12 September 2019. Astronomically speaking, that date would still fall within summer, but we doubt the ECB is taking a stringent stance on this definition. You get the idea. This was flawlessly executed. At least in terms of controlling the near- to medium-term risks while allaying fears that the ECB isn't doing enough to try and normalize policy ahead of the next downturn. 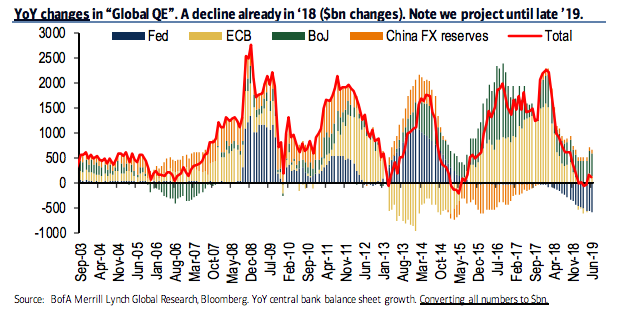 As ever, the risk is that by the time rate hikes get going in earnest and the ECB gets out of NIRP, the economy will have rolled over, leaving them with little in the way of counter-cyclical ammo either in rates or on the balance sheet (especially in light of self-imposed issuer cap constraints). But frankly, there's nothing they can do at this point to materially reduce that risk. They're too far gone to make a run at getting rates materially off the lower bound and/or freeing up substantial room on the balance sheet over the next two years. That's not realistic. So they're doing what they can. There were other nuances that lend still more credence to the notion that this was a deftly executed maneuver. For instance, the ECB preserved the conditionality in the statement and Draghi emphasized the unanimity of the decision in the presser. At the same time, the fact that this announcement came in June as opposed to July was a nod to the Governing Council's confidence that the deceleration in economic activity in Q1 was indeed "transitory" and that the turmoil in Italy will dissipate. Oh, and Draghi was deliberately vague on reinvestments. And on and on. That right there didn't do emerging markets (which are more sensitive to moves in the greenback than they are to moves in the euro) any favors. Still, there's a strong argument to be made that Draghi has just gone a long ways towards ensuring that rates volatility in Europe will remain subdued and that, in turn, should feed through to credit and other assets. There you go, bulls. Draghi has done everything he can possibly do for you. So you know, before you join the folks lauding Jerome Powell's "plain English", do note that the economist across the pond just pulled off a miracle of monetary policy communication.